We have come to the end of the football season and it was one to remember for many fans. Bayern Munich and Chelsea won the big European competitions and normal service was resumed in a lot of countries with winners such as Manchester United, Barcelona, Bayern Munich, Juventus, Ajax, Porto along with big spending PSG winning their first title since 1994. It’s now time for everyone at The Sports Lab to pick their teams of the season and give you a short insight as to what those players done to deserve their spot. I feel I’ve found a nice balance in this side with quality throughout. Neuer was the outstanding choice in goal nobody got near his levels this season. Lahm at RB had a challenge as Atsuto Uchida of Schalke was amazing this season but Lahm pipped him to the spot. It was a toss up between Schmelzer and Alaba but went for the Dortmund man as he just done that little bit more for me. Silva and Dante were a shoe in for me, both players were outstanding, only Matt Hummels could have possibly sneaked in. Mata on the right so he can cut in on his left, top talent and has been immense the past few seasons. Bale has had his best ever season for Spurs and nobody comes close to him on the left hand side of the park. I believe my two centre mids contain two of the top 3 midfield players in the world right now form wise. Both had breakout seasons for their respective clubs and nobody gets close to the pair. Marco Reus however is very unlucky not to make my side but I needed Vidal to be the defensive guy alongside Gundogan or my team would leak goals! My forwards pretty much picked themselves, I decided not to pick Ronaldo or Messi as thats too obvious plus I think Falcao and Lewandowski have not only had better seasons but would work better together also. 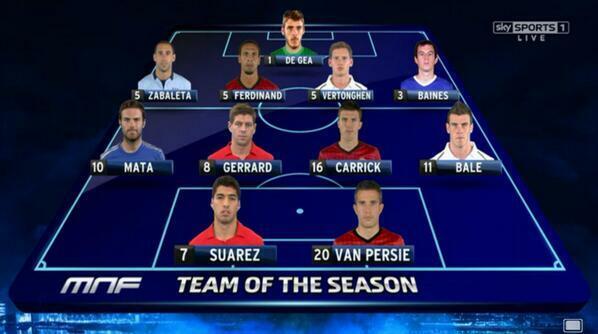 Guy like Edinson Cavani and Robin van Persie were considered but they don’t match up to my picks. My choice for goalkeeper is a no brainer in my eyes has been most consistent keeper in Europe this year my defence is a good mix of youth and experience same with my midfield. My strikers are two of the most lethal hitmen in the game I feel this is a solid team because I couldn’t even find a place for names like Dante, van Persie or even Messi. Its a bit of a bundesliga theme to it but thats my team of the year. I’d like to point out that I’m basing this off of players I have seen. This is my personal team of the season. I feel all these players have earned the right to be in the team. They may not be recognised internationally as the best players in their position’s and I will not claim they all are, but nonetheless they have impressed me immensely over the course of the season. It would be easy to give this to the likes of Neuer, Lloris or Ter Stegen but despite these 3 being brilliant keepers they have not impressed me half as much as Begovic. Not only do I feel that he has been outstanding this season for Stoke, he has also vastly improved since last season. Only David De Gea, I believe, has a better shot to save ratio in the EPL. The Bosnian has played brilliantly this season keeping 12 clean sheets, I’m sure Stoke will find it hard too keep hold of the former Portsmouth man in the summer. I feel Azpilicueta has been rather underrated for Chelsea this season since arriving from Marseille in the summer of 2012. The Spaniard has made a string of consistent performances for Chelsea this season, playing 38 times in all competitions. Though I would not say he was a standout performer this season overall he is definitely only one of 2 possibly 3 right backs that have impressed me this season. I predict big things from the 23 year-old next season.The Dutchman who signed for Spurs last summer for Ajax has really impressed me this season. Not only has he shown that he is one of the best centre backs in the EPL, he has also shown his versatility being able to operate on the left of defence or even in midfield when needed. The Tottenham number five bagged 5 goals and 4 assists in 46 games for the White Hart Lane club this season. Much has been made about his defensive partner Mats Hummels this season but I feel that Subotic is the unsung hero of the Dortmund team. For me he is better than Hummels and though injury may have hampered his season slightly he still managed to play 36 times for the former German champions one of those appearances being in the Champions League final in which he made one of the best goal line clearances I have ever seen. This may be controversial view to hold, but I maintain the opinion that Baines is one of, if not, the best left back in the world. this season has shown this. He has it all, he is sound defensively and is also a threat going forward. He has pace and can hit a mean set piece with that beautiful left foot of his. Though he only scored 5 this season for the blue half of Merseyside his overall contribution to the club has been outstanding. For me Reus is a brilliant player. Not only is he a skilful, pacey winger, he can also come inside and play football as well. He has been epic for Dortmund. The German has scored 18 goals in 45 games this term not a bad return for a winger, though he does play just behind the striker at times. Cazorla is a player who I had admittedly heard little about before he burst on to the EPl scene this season with Arsenal, scoring 12 and creating 12 in 45 appearances . The former Malaga and Villarreal man enjoyed a very successful season with the gunners as he helped them to 4th spot and champions league football next season. The young Belgian has been brilliant this season with Bremen. He creates and scores at will and is still only 21. He has scored 10 this season in which he has been a spark of excitement in what has been a largely disappointing season for Werder Bremen who ended up staving of relegation despite starting the season with hopes of a place in Europe nest season. my only worry is what will happen to him next season when he returns to Chelsea as they have more than enough attack minded midfielders. Though his main position is up front he can operate outside and I feel is even better out there. His raw pace sees him skipping past many a defender. The only disappointing thing for me this season is that he has only scored 6 goals hopefully he can improve on this aspect of his game next season.The Spaniard has got to be Bargain of the season arriving at the swans for only £2 million from Rayo Vallecano and scoring 18 goals in 35 games. He is among the best finishers in the prem you’re almost guaranteed that his shot will hit the target when it leaves his boot. Is there a better striker in the world right now? Ok so he is not the top scorer in the Bundesliga, that accolade went to Stefan Kießling, but in my opinion he is the best around right now. To me it would be a shame if he does go to United in the summer, yes it would mean I would see more of him as he would be in this EPL, but it would be a huge loss to Dortmund and the Bundesliga. Yes there a plenty more players who probably deserve a place In this team, and I am not claiming that this is the best starting XI in the world right now. This is simply the eleven players who have impressed me most over the course of the 2012/2013 season. Which players would you select? Comment in the box below your best 11 of the season or get in touch with us via our social networking sites which you will find on the top right hand side of this page. Thanks for reading our latest blog and we will have more content for you very soon! Interestings choices you guys made. I’m surprised tho no one picked Sirigu the GK from PSG, has this team has the most matches without taking a goal in Europe and he is top 3 in percentage of saves ! Weirdly also that no one mention Ibrahimovic being the 4th scorer in Europe and delivering numerous assists (including 4 in on CL game which is a record). I guess french championship is still weak compared to this others, as Matuidi has been acclaimed all year with stunning matches and consistency we both his club and the French national team. Nice review anyways guys ! Sirigu is a quality keeper no doubt but most of us were judging this on teams we actually seen play for most of the season. And for me personally (Andy) Ibrahimovic was 3rd on my list for top strikers in Europe, Zlatan is an absolute hero and I’ve admired him for many years but Lewa and Falcao just pipped him! At least Thiago Silva got in eh! I’m sure French football will be a much more popular league next season as Monaco will battle PSG for the title in the battle of the billionaires! Will be interesting to see how Lyon, Marseille, Lille, Nice, St Etienne & Bordeaux respond to these two spending big. Thanks for reading and commenting on the blog much appreciated!